Whether you consider him an impetuous officer who doomed the British at Isandlwana or a doomed hero in the best Victorian tradition, Lieutenant Colonel Anthony Durnford was an experienced, brave warrior who was loyal to his men and inspired loyalty in others. One of the most iconic portrayals of this historical character can be found in Zulu Dawn, first released in 1979. Here, Burt Lancaster shines amongst a venerable cast and presents a populist version of Durnford, right down to the last entreaty to pass on a message to his beloved in Natal before turning to lead a ragtag group of men in a Last Stand par excellence. 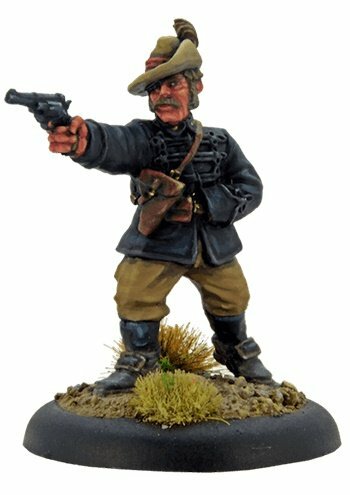 Our figure depicts this version of Durnford, pistol blazing as the Zulus storm the camp at Isandlwana, choosing to give his life to enable others to flee.